Where: Exams are offered nationwide. When: Exams are offered year-round. How: Exams are multiple choice. Why: Exams are required for state licensure. Time: Time limits range from under an hour to over four hours. Preparation: Candidates should become familiar with the stateâ€™s particular real estate laws and the general real estate industry. Cost: Costs range from around $50 to over $100, depending on the state. Every state requires real estate sales agents to be licensed prior to engaging in the sale of real estate within the state. Licensure is generally earned with the successful completion of an exam. Licensure is granted by the state’s real estate commission or real estate department. It is important to note that the sales agent exam leads to state licensure as a sales agent; the Realtor designation is granted through membership in the National Association of Realtors. 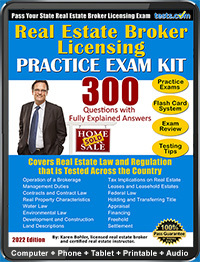 Every state’s exam is different, but they all generally cover the same categories of real estate-related topics. In every state, real estate agent licensure is handled by the state’s own real estate commission. The commission will outline rules and regulations that are specific to the state, such as requirements for education and exam content. Each state has its own education requirements that must be met before one is eligible to take the sales agent licensure exam. Generally, candidates must take a set number of real estate courses. In California, for example, candidates must complete Real Estate Principles, Real Estate Practice, and one from a list that includes Real Estate Appraisal, Property Management, Real Estate Finance, Real Estate Economics, Legal Aspects of Real Estate, Real Estate Office Administration, Escrows and more. In Pennsylvania, candidates must complete 60 hours of approved real estate courses. Members of their state bar associations are typically exempt from the course requirements, as are those who hold bachelor degrees with a major in real estate. Such candidates are typically permitted to take the exam without retaking real estate-related courses. 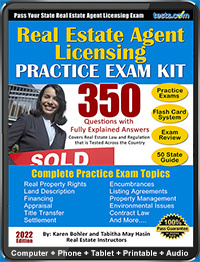 National testing organizations, such as PSI Exams, offer approved real estate agent licensure exams for most states. Registration and all test information for each state can be found online at psiexams.com. Exams are available specifically for the state and nationally. Exam lengths vary widely; in Pennsylvania, the one hour exam consists of 30 multiple-choice questions, while in Kentucky, four hours are given for 120 multiple-choice questions. Registration costs vary widely as well; in Kentucky, the exam bears a $100 fee, while Pennsylvania’s exam has a $56 fee. PSI has test locations throughout every state; candidates can find the location closest to them while completing the online registration process. When taking the exam through PSI, score reports are available immediately following the exam. Scores will show immediately on the computer screen, and paper reports can be printed at the test site. 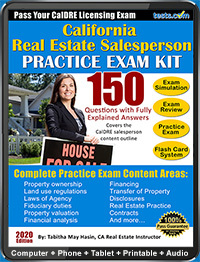 For more information on real estate sales agent exams, please visit the Real Estate Sales Agent Directory.